HIDDEN IN PLAIN SIGHT – Get to know the street vendors who bring life and flavor to NYC sidewalks. Get to know the street vendors who bring life and flavor to NYC sidewalks. Hidden in Plain Sight is a mixed-media installation that shares stories of New York City street food vendors through interactive 3D printed sculptures of food carts and the people behind them. 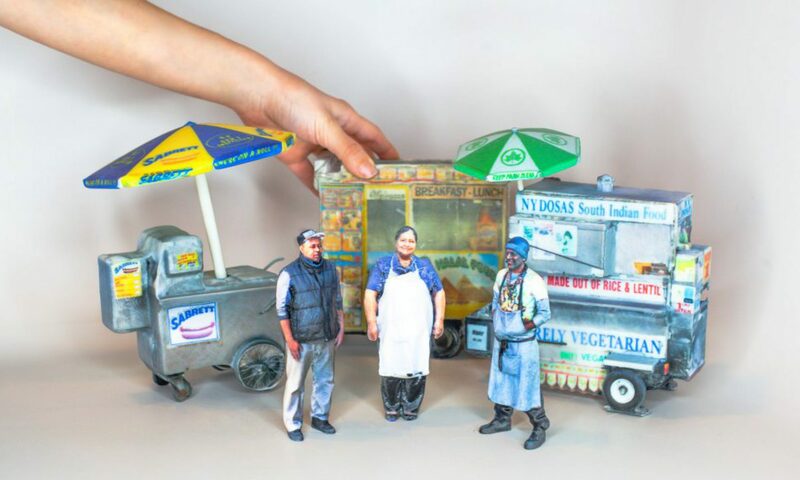 In this series of portraits, each work features video and audio merged into 3D printed high-fidelity sculptures of food carts and the people behind them – Ana, Dany and Thiru. The piece offers a new approach to documentary, merging older media formats with newer technologies. High fidelity 3D scanning techniques were explored in order to use the physical model of the cart as small canvas. When users interact with it, audio is triggered and the vendor starts sharing their stories in their own words. As the narrative unfolds, minimalistic animations that complement the audio tracks are mapped on top of the cart. Immigrant communities are responsible for the creation of the iconic culture of street food that is so particular to NY. Together, the three people portrayed in the project reveal different pieces of a complex and broken street vending system. In our current cultural climate, where immigration and cultural differences at the forefront of many conversations, this project aims to give both immigrant communities a chance to share their stories, and the broader public an opportunity to see the important and enriching cultural layers that exist beyond the food carts. Thiru Kumar is also known as the Dosa Man from Washington Square Park. Originally from Sri Lanka and serving South-Indian vegan food, Thiru has conquered a loyal fan base of customers who are willing to stay in a long line just to get a bite of his dosa. Ana Herrera is an Ecuadorian woman who has proudly served hotdogs and tamales in Corona – Queens for the past 17 years. She has been fighting for a vending permit for more than a decade and today she faces the dilemma of renting somebody else’s permit in the black market or taking the risk of working without one and getting arrested. 721 BROADWAY AVENUE – NEW YORK, NY. Michelle Hessel is a multimedia creator born in Sao Paulo and based in New York City. She is currently a Research Resident at the Interactive Telecommunications Program at NYU. Her interests lie at the intersection of technology, non-fiction storytelling and transmedia immersive experiences.